Yoshi is the friendly little dinosaur from the Mario games. Unfortunately, he was caught and now is trapped in a cage. Your task as a good friend is to now save Yoshi and to free him from his cage. In the best Super Mario style you will jump into this exciting Jump 'n Run, going through 8 missions with just 5 lives and only one shot in which to use them. The game is played using only the arrow keys on the keyboard. With the 'up' arrow key you can jump, with the 'left' and 'right' arrows you move around and you can go into the tubes with the 'down' arrow key. You can also reach the individual missions through the tubes. If you want some guidance, you may like to play the tutorial on the far left in the overview. For the first tutorial, only the first mission is available, as you have to unlock all the other ones as the game goes on. With time, you will get better and will start to know the maps well. At the end you must jump on the blue button, which will release a star. 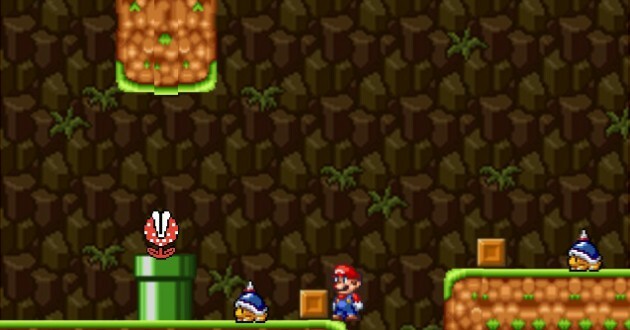 This blue star gains you entrance to the mission in this version of Mario. Save Yoshi is a very pleasant Mario game. Unfortunately, it is not really great, but the graphics are good, the gameplay is right and you can spend quite a lot of time playing it. If you looking for a challenge, you will be satisfied with Yoshi, but a lot of other games that are more difficult can be found here on our little page. Have fun rescuing Yoshi and show that you are a good Mario. You have to be very good to complete all of the missions. Do you like Save Yoshi? If you like Save Yoshi, please click on the Facebook Like Button. With help of the likes on games, we generate our top 10 charts.